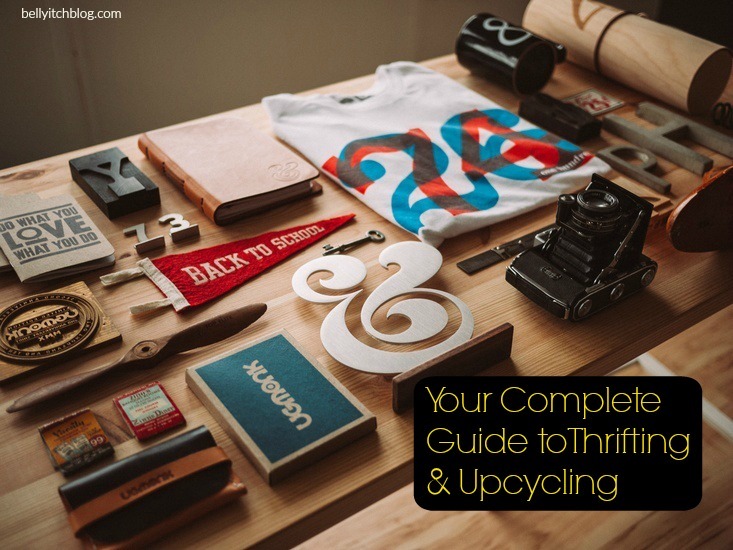 Your Complete Guide to Thrifting and Upcyling Like a BOSS! Saving money is trendy, believe it or not and so is Thrifting! When thrifting for larger items that you may fix up, polish, reupholster and DIY (Do-It-Yourself) into a new masterpiece, it’s called Upcycling! Rare finds like vintage armoires and antique dressers are among the best pieces of furniture to repurpose, collect, or display in your home. But even ordinary used furniture and housewares can be transformed into unique and functional pieces! Collecting and repurposing furniture and household items is all the rage right now. Images of refurbished and made-over salvaged pieces can be seen splattered all over Pinterest and Facebook. Since part of an upcycler’s job is turning trash into treasure, it’s important to learn the ins and outs of thrift shopping. If you are new to this, knowing where to begin can be tough. This guide helps you learn what to look for while thrift shopping, where to go, thrift shopping etiquette, and money-saving tips for garage sales and estate sale shopping. It also includes suggestions on what types of housewares are easiest to upcycle, and types of furniture that are best for beginners to refurbish or make over. 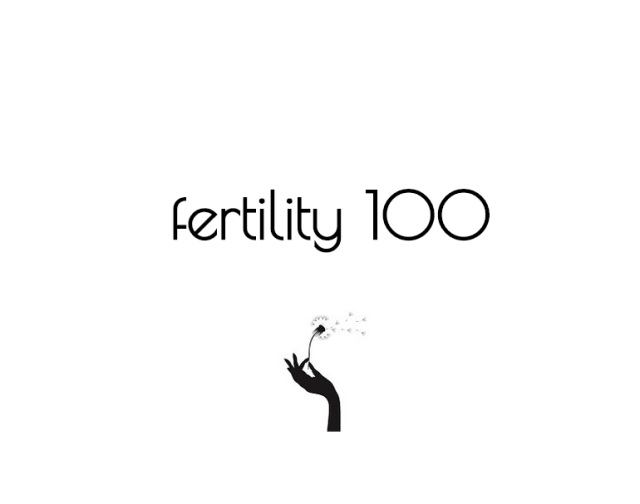 Start by conducting some online research. A great source for finding estate sales in your area is Estatesales.net. This site offers photos, maps, and directions, and you can search by city or county. Other sources are your local PennySaver magazine and Craigslist. Craigslist has a section for local garage sales, and under “for sale” there is a section called “free.” You can find real-time curb alerts in your area. You can also download a Craigslist app to your phone to make treasure hunting easier. To find the best places to go, ask your friends and join social media groups. Goodwill, for example, has a vast selection of housewares available most of the time. Preparation is key when thrift shopping. Keep a small bag in your car for planned and unplanned shopping trips. Here are a few things you should keep inside this thrift shopping emergency kit. Tote Bags: Many estate sales and garage sales do not provide bags. Keep a few neatly folded in your emergency shopping kit. Newspaper: Newspaper or scrap packing paper comes in handy for delicate items. 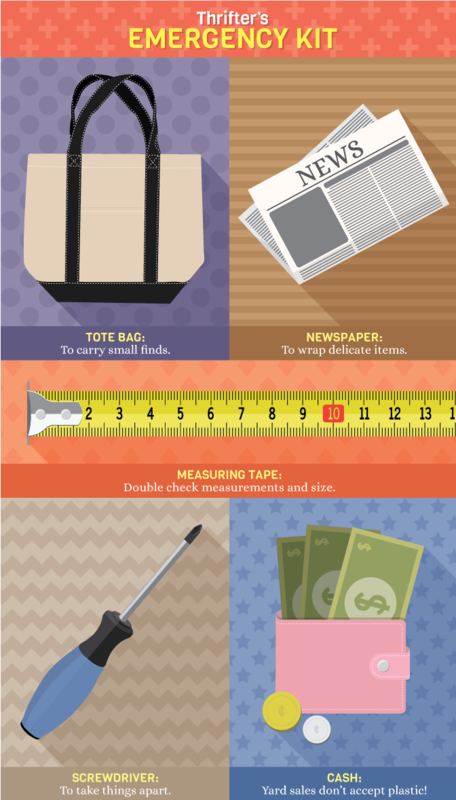 Measuring Tape: Keep a small tape measure to ensure accuracy when shopping for large items. Screwdriver: For large items that may need to be disassembled to fit in your car. Cash: You shouldn’t necessarily keep a wad of hundreds in your emergency kit, but keep in mind that most estate, garage, and yard sales will be cash-only. Wish Lists: It’s important to remember your needs versus your wants. It’s never a good idea to shop frivolously. Even if you are getting a good deal, it’s good to know when to say no. Keep two lists – what you need and what you want – to prevent overspending. List of Measurements:This is handy if you are furniture shopping. If you are looking for the perfect chair for your living room, for example, make sure you know the dimensions you need. This way, you’ll be certain your new piece will fit perfectly. 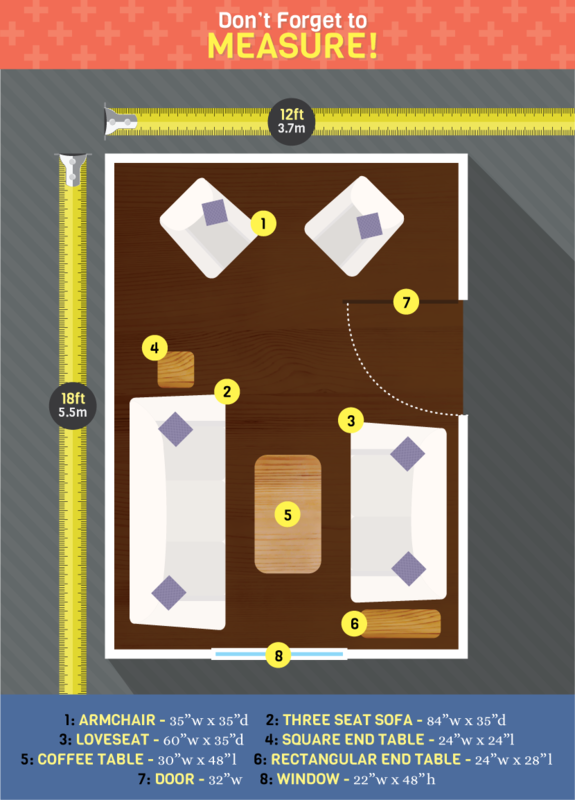 Before heading out to find the perfect coffee table to paint or armchair to reupholster, be sure to measure your room. Measure its length and width, as well as any relevant wall space. Consider doors, windows, fireplaces, and existing furniture. It helps to make a rough sketch of your room and placement of your furniture. Don’t worry – it doesn’t have to be to exact scale, but this way you’ll have a better idea of what fits before making an ill-fitting purchase you may regret. Now that you are armed and dangerous, thrift shopping etiquette should not be overlooked. Here are a few helpful hints to keep in mind. Estate sale shopping is a little different than thrift store shopping. There are two schools of thought when it comes to upcycling at estate sales. You can get there early and be the first person there, or wait and go at the very end. Getting there early is good because you will have the most selection. However, if you wait until the end you have the most negotiating power. If you are just browsing, you may benefit from waiting until the end and finding an awesome deal, but if you have a specific item in mind, your best bet is to get there first. Next, be sure to shop with heightened sensitivity. Estate sales are often conducted by someone who has lost someone that they love; the items on sale have meaning to the seller. Finally, have fun and be patient. It may take a few estate sales to get used to the process. Estate sales, garage sales, and thrift stores are great places to get inspiration and find your next DIY project. With a little preparation, knowledge, and fortitude, you can find hidden gems and turn someone else’s trash into treasure. But for beginner upcyclers, perusing cluttered shelves and tables can be overwhelming. Sturdy glass vases, containers, baskets, and wooden bowls can be easily painted, frosted, wrapped, decoupaged, or embellished. They can be used not only for flowers or fruit, but for storage, organization, and gift wrapping as well. 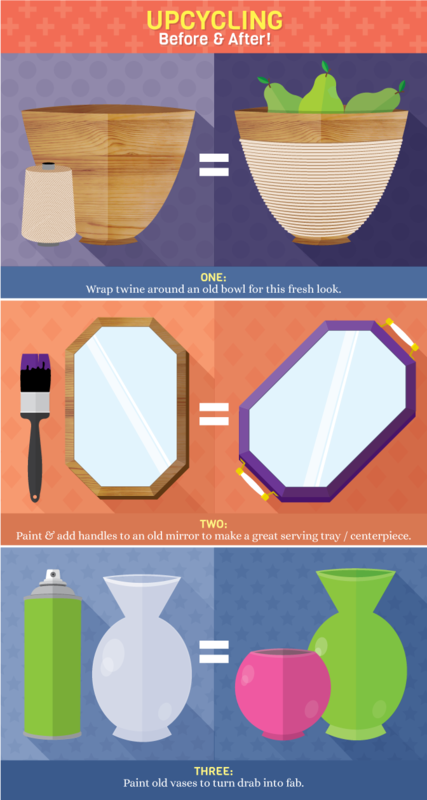 Mirrors and frames can easily be transformed and repurposed as well. Source: Fix.comSmall furniture pieces like chairs, side tables, accent tables, stools, and ottomans are great pieces for newbies to make over. Examine the piece before you buy it. Make sure it can be easily taken apart and put back together. If it looks too difficult, pass on it until you are more experienced. For upholstered pieces, if it smells bad, just say no and move on. Some smells are impossible to get rid of. Also, do not pay attention to the color or fabric. It can always be changed. Rather, look for the shape, lines, and curves that interest you. Small scratches and blemishes can be easily repaired as well. Your trash to treasure adventure can now officially begin. You know where to look, what to bring, how to act, and what to look for. Ready, set, thrift!